The powerful typhoon that struck Japan recently led to13 people dead and 38 others unaccounted. Police officials stated that the numbers are more likely to increase in the coming days. The typhoon lashed out on the Pacific coast, and swept away five houses as a result of floods and landslides. Badly affected was the Oshima Island, located south of the Japanese capital, 120 km away. This was relayed by local officials and public broadcast via NHK. Of the fatalities, two bodies were found on the river and one was pulled out of a collapsed house. Two more people who were similarly trapped were rescued by emergency workers on Wednesday morning. Rescue units and firefighters were not able to penetrate other areas due to the inclement weather, said NHK. However, officials from the City Hall and Fire station were continuing with the rescue operation in places that are still accessible, as relayed by local officials to AFP. Of those affected on Oshima Islands, 38 residents were still unaccounted for out of the island’s 8300 inhabitants. It is not immediately known if they have just lost contact with their immediate families or they may have eventually perished in the rushing floodwaters. Live footages taken in the area — which is known as a tourist destination and of camellia flowers— showed the extreme devastation of this once beautiful island. Mangled and fallen trees were strewn everywhere – on highways and around houses— and on every nook and cranny of the place. Mud, debris, and dirty waters gushing into homes were everywhere— a clear sign of the mass devastation that recently took place. Fifty special police enforcers were sent to the area by the Tokyo Metropolitan Police to serve as reinforcement to secure the place. In other areas, helicopters were used to locate two missing elementary boys who were seen near the beach on the onslaught of the storm, in the southern part of Tokyo, Kanagawa Prefecture. Another man in his 50’s was reported missing in Chiba Prefecture. He had earlier reported to the police of a landslide on the back of his house. At the Fukushima nuclear plant, officials said that they released rain water that was trapped inside the barrages, but there was no indication of radiation leaks. There was no report of damages sustained in the power station, where tonnes of radiation-contaminated waters were stored after being used as cooling agent for the reactors. Preparations are underway to properly manage contaminated water. Patrols of places where entry of rainwater may be possible were increased, and are now being watched keenly. Other peripheral works were halted and cables/hoses were bundled together, said a company spokesman earlier in the day. They have admitted that around 430 liters of contaminated water had spilt from the bank as work was done to remove rainwater at the plant due to recent typhoon. This was relayed earlier this month by company officials. They admitted that contaminated water may have spilled out to the sea with the recent typhoon. The TEPCO president had been summoned by Japan’s nuclear watchdog for a dressing down on the sloppy work at the plant, after it was hit badly by a tsunami in March 2011. Critics believe that the plant still remains in critical state and would pose a risk to public safety during inclement weather. The other day’s Typhoon Wipha brought extreme weather disturbance in Tokyo’s central district — that disrupted the early morning flow, by more than a hundred thousand commuters. Japan’s weather bureau had said that the typhoon was moving towards the northeast direction and was shifting away from the territory. Tokyo was badly hit in the early morning as violent winds and heavy downpour battered the city as Typhoon Wipha moved towards the northeast coast of central Japan. Thousands were left homeless as they were evacuated in the prefecture of Chiba. Power interruptions occurred early on in the day. 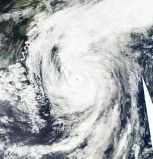 The typhoon’s landfall was expected to hit the highly populated Kanto region that included Tokyo. With winds peaking at nearly 200km per hour at its epicenter, Typhoon Wipha moved northeast at 55 km per hour in the early morning, as reported by Kyodo. The typhoon’s direction was forecasted to strike the coast of Fukushima in the afternoon. This is the site where the battered nuclear power plant is situated and had experienced heavy rainfall early on in the week. Typhoon Wipha was said to be the strongest typhoon that hit the Kanto region (Tokyo and vicinity) in the last decade, as relayed by Hiroyuki Uchida, Chief Forecaster of Japan’s Weather Bureau, in a press conference held last Tuesday. Among other news, the Japan Airlines announced that all 500 flights, scheduled for Wednesday were cancelled. The rail companies have likewise cancelled services for 30 high-speed trains and of 100 other trains. Nissan advised all automaker employees in the Kanto region to stay home. Schools have also been cancelled until further notice.